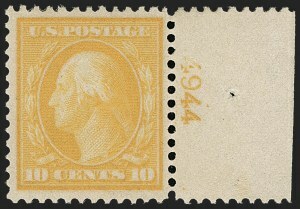 VERY FINE AND CHOICE ORIGINAL-GUM EXAMPLE OF THE 10-CENT ON BLUISH PAPER. The plate number selvage is especially desirable, as it clearly shows the deeply blued paper. Only four plate blocks are available to collectors, and we have offered only two other items with the plate number -- both were from the bottom position, with narrow selvage showing only part of the plate number.